Without a doubt the main reason I visit Seahouses when it comes to food is for the fresh fish. I genuinely believe you get the best Fish and Chips in the County right here in this little fishing port. There is big competition in Fish and Chips market here, but the one shop I feel stands above all the others is Neptunes. It is located right in the centre of the town and we never visit Seahouses without paying them a visit. They have been operating in Seahouses for over twenty years and offer a comfortable restaurant as well as a takeaway service. 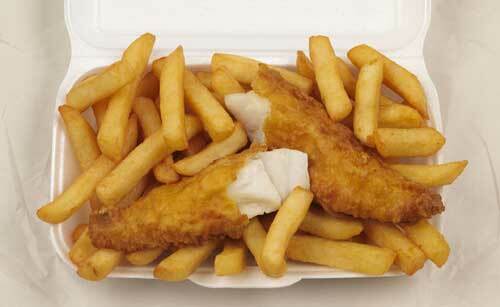 I like to grab a takeaway and if it's a rough day sit in the car park and watch a stormy sea crashing over the rocks and harbour wall while enjoying my wonderful lightly battered Fish and fluffy Chips. Buy a full guide of where to Eat and Drink in Northumberland. The Black Swan should be near the top of your list if you need to eat out in Seahouses. This Bar and restaurant is located at the South end of the Harbour on the junction between Union Street and Main Street. The restaurant is somewhat tucked away behind the bar area when you enter and is open from Mothering Sunday through to the end of October. Excellent quality food is to be found here and the they have become famous for their pies, which I wouldn't dare tackle unless I was very hungry! The bar, however, remains open all year round. Another Public House that offers good quality food and has an excellent location. Their Beer Garden at the back of the pub has the wonderful benefit of stunning views across the harbour, making this a lovely place to have a drink if the weather is agreeable. They offer a good mix of cask ales in a quirky and cosy bar. 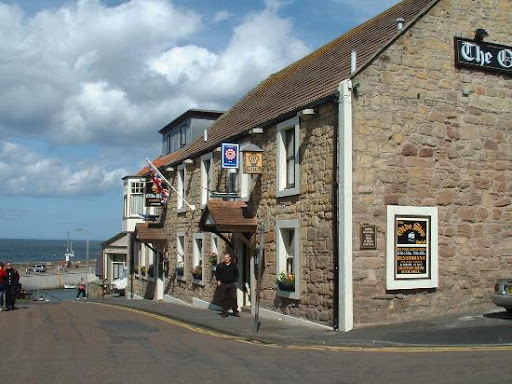 This Inn is situated right on the front of the harbour, you really can't miss it. The views from the restaurant out across the harbour really are lovely and on a sunny day, like at The Olde Ship, it's good to sit out and enjoy some sea air. They offer an extensive menu which includes an excellent choice for the kids. They are CAMRA accredited for serving their real ales and also LocAle accredited for their local real ales, which all have different and unique characters. There are cheaper places to enjoy a meal in Seahouses, but this is certainly a case of getting exactly what you pay for... and with a great view! has the best reputation for Indian Food in Seahouses. They have a restaurant and also offer a takeaway service. Staff are friendly and the service is good, if a little chaotic when it gets really busy in an evening, which it regularly does. The food is fresh and delicious though, and well worth a visit if you like a bit of spice in your meal. The restaurants highlighted above are shown on our interactive map of Seahouses along with other points of interest and amenities. Birdie Restaurant - Seahouses Golf Club, Seahouses Restaurant Serves breakfasts and lunches daily.